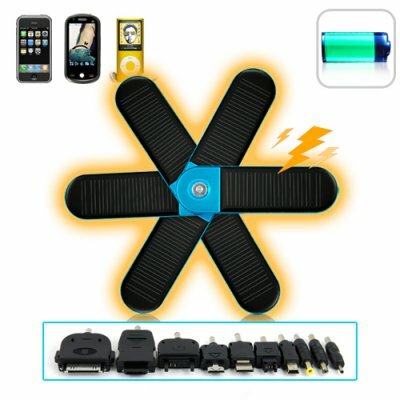 Successfully Added Sunflower Solar Portable Charger for Cellphones, iPhones, USB to your Shopping Cart. New Sunflower Solar Portable Charger is a compact, stylish and Eco-friendly solar charger for use with Cellphones, iPhones, iPods and many other USB devices. Inspired by mother nature and constructed in the same broadleaf arrangement used by flowers to soak up sunlight, the 6 mini solar petals can be expanded to maximise sunlight absorption or folded together to easily fit into your pocket, hand bag or suitcase. Take advantage of solar energy, which is renewable and totally free, you can leave it under the sun and the internal battery will automatically gaining charges. You can also recharge the battery using conventional AC power or USB charging method. The Sunflower Solar Portable Charger comes with 10 different charging adapters that you can use to charge any USB devices, iPods, iPhones and many popular cellphone models. So if your mobile runs out of battery in the middle of an important phone call, or your MP3 just lost its power and you want it to come back immediately, simply connect it with the portable sunflower solar charger and it will be back online in no time. This next generation solar charger is efficient, affordable and stylish. It is a great product for personal use and resellers. Grab a sample to see how cool and convenient it is, and get a few more for you eBay storefront to make a nice profit. Available at our famous wholesale price and only from the top electronics wholesaler - Chinavasion. What kind of devices can I charge with this solar charger? You can charge iPhones or iPods as well as any device that can charge through USB, such as cell phones, cameras, MP3 and MP4 players, GPS devices, and numerous other gadgets.